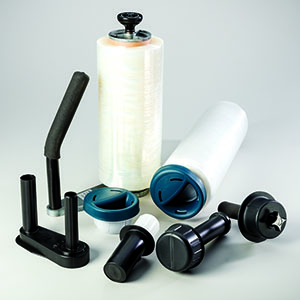 Stretchtape’s stretch film grips and dispensers are designed to increase productivity when applying stretch films. Our grips and dispensers feature strong and rugged handles and are built to last with an ergonomic design. Using these products also reduces operator fatigue and helps them avoid unsafe positions when wrapping. Dispensers are available with adjustable tension handles to best align a package for wrapping and maintain ease for the packer, increasing efficiency in time and film usage. By setting your optimum stretch ratio equipped with a rotating dispenser and a stationary handle, the process of wrapping is made easier and more efficient. Additionally, each case of Stretchtape banding film has a blow molded handle included. Upgrades are available. In addition to the benefit for the worker, grips and dispensers reduce the amount of material waste and avoid product damage during wrapping. The product handles allow the user to apply film in a smooth and precise manner from the top all the way to the bottom of products or pallets, keeping products safe and tightly packed. Our lightweight compact stretch wrap dispenser allows for quick roll changeover and requires no operator training or tools. Convenient design stands upright by itself saving stretch wrap from tipping damage.